The first intention for BSM was to pay tribute to the pearly-sweet and creamy live tone, known from the British guitarist Andy Powell during 1973-76. His band Wishbone Ash was one of the leading European bands at that time, well known for their twin harmonic playing of the two lead guitarists. BSM focuses on the 1973 clean & boost live sound of their folk-rock songs like “Ballad of the Beacon” or “Blowin’ Free”. The AP-WA medium gain Treble Booster is mainly designed for medium or low output PAF style, Mini Humbucker or P90 fitted mahagony type guitars to achieve many classic sounds of the 70s. 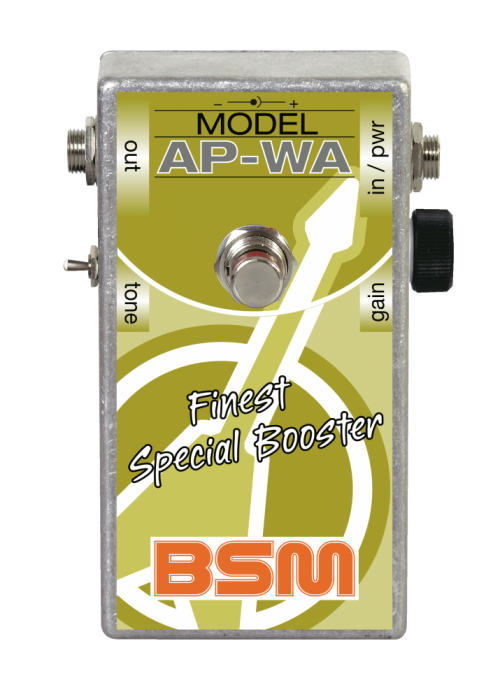 he BSM AP-WA Treble Booster is almost a clean booster with a special frequency response. If you set a guitar’s volume control (fitted with standard PAFs) at full, the unit overdrives a tad. If you dial the guitar’s volume lower than #9, the unit works in perfect clean mode. Depending on the amp’s crunch or clean tone, you will have lots of possibilities. The AP-WA booster has a 2-way toggle switch for tone match. Note: for technical reasons the gain control works counter clockwise, gives you the most gain on the full left. After designing the AP-WA for the main purpose to pay tribute to Andy Powell, it became obvious, that there are many more possibilities if you are into that Classic Rock thing. When using an ES-335 Type of guitar you may find yourself remembering Rainer Baumann’s highly dynamic and creamy sound with the German band Frumpy in 1971/72 (e.g. on “How the gypsy was born”). In 1972 Baumann was the most popular guitarist in Germany according to “Musik Express” and other magazine polls, ahead of the usual international suspects. With the mini switch in the fatter position you can achieve Gary Moore’s famous Les Paul with Marshall tone. The switch set in the more slender tone position enables you to copy Michael Schenker’s glorious Flying V live tone of UFO’s live classic “Strangers in the night”. Use an already crunchy tube amp, turn the gain knob all the way up and do the rest with the guitar’s volume control. Easily blend between clean, crunchy rhythm and full lead blast. The AP-WA Treble Booster dramatically increases the dynamics of your signal chain. Muddy sounding neck pickups can be cleared up with transparency. The AP-WA Booster has to be inserted between guitar and amplifier, not into the FX loop. The magical tone is achieved by the interaction between guitar pickup, booster and amplifier. A 9V battery with a current consumption of approx. 260 uA powers the unit. Because of the external DC jack, you can power the AP-WA with 9 volts. The average output level is 5 dBm, the maximum output voltage when the strings are struck really hard is 4V. Note: The negative pole of the battery is ground! All BSM Boosters work true bypass when switched off. If you have any questions concerning our products, especially the BSM AP-WA Treble Booster, our tech-head and mastermind Mr. Bernd C. Meiser would be happy to talk to you. So don't hestitate any longer and send him an email to info@treblebooster.net or use the contact form to contact him.